that will take place in Geneva next January, Parmigiani Fleurier unveiled the Tonda Métrographe Abyss Blue, an elegant chronograph equipped with the automatic PF315 calibre, a movement entirely manufactured by Vaucher Manufacture Fleurier, the brand's manufacturing centre. The 40 mm x 11.7 mm case in polished stainless steel is asymmetrical with two different profiles. The left-hand profile is the classic, conventional side, and displays a teardrop shape. The right-hand profile features elongated lugs which extend to the crown, reaching around it to envelop the chronograph push-buttons. 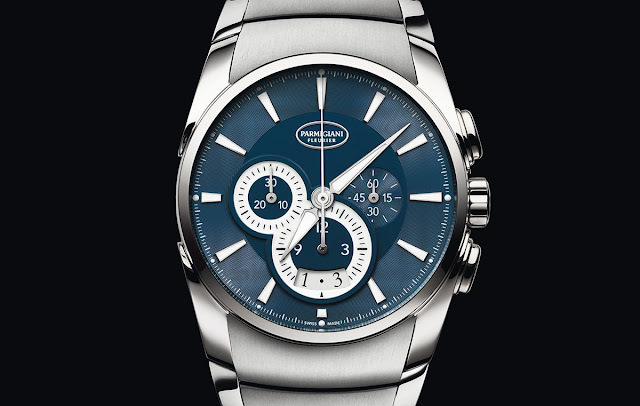 The dial of the Tonda Métrographe Abyss Blue version - snailed on the outer ring and opaline at the centre - was designed using the principle of contrasts to make the chronograph complication stand out, thanks to the accentuation of its two minute and hour counters which are treated with Super-LumiNova to highlight them in the daytime and make them glow at night. 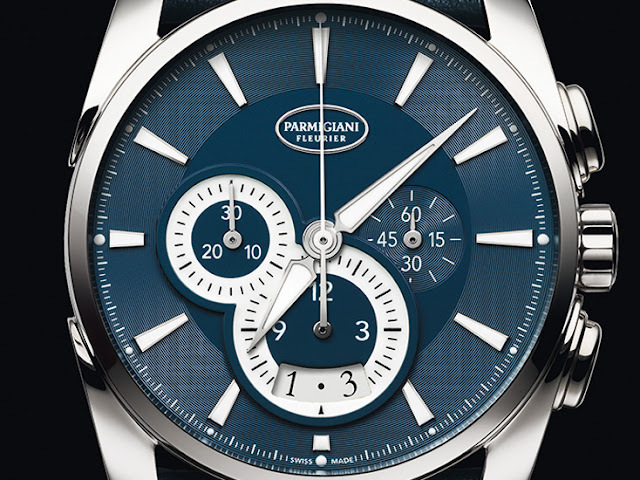 The two counters - 30 minutes at 9 o'clock and 12 hours at 6 o'clock - form a slanted figure 8, a recurring sign of the Parmigiani Fleurier brand. 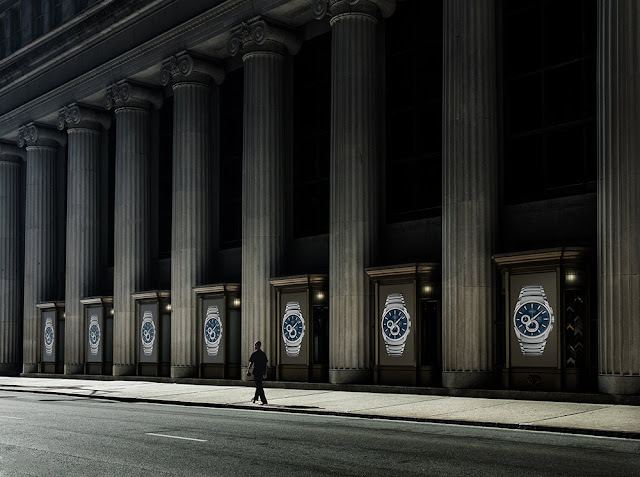 The three-date aperture is integrated in the 12 hours chronograph counter while a discreet small seconds sub-dial is positioned at 3 o'clock. Creating the Abyss Blue shade requires a special savoir-faire. The dial must be immersed in an electroplating bath, with a certain current, at a perfectly controlled temperature. Under the effect of electrolysis, the colour is transformed: the initial bright orange shade turns into an almost rust-coloured brown. Then, purplish tones appear until the blue-violet hue turns into the desired colour. Without losing a second, the piece must be quickly removed from the bath or the colour will change to royal blue, then grey. 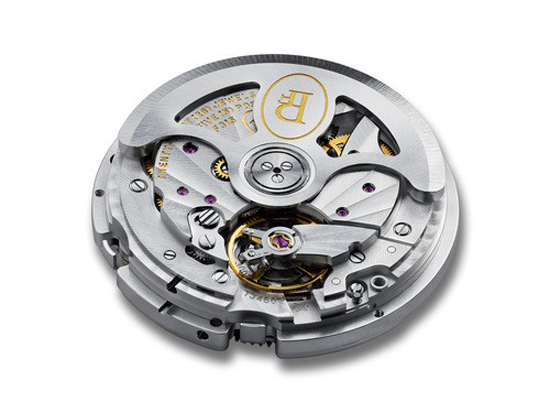 Decorated with Côtes de Genève, the self-winding PF315 movement beats at 28,800 vibrations per hour and offers a power reserve of 42 hours. The variable-inertia balance makes it possible to adjust the moment of inertia by rotating the inertia blocks rather than adjusting the active length of the balance-spring as required with a standard adjustment. It also makes the watch shock-resistant and delivers outstanding isochronism. This consistency is reinforced by the double barrel which enables a more stable, linear distribution of power than a single barrel in the calibre. Pre-SIHH 2016: Parmigiani Fleurier Tonda Métrographe Abyss Blue. 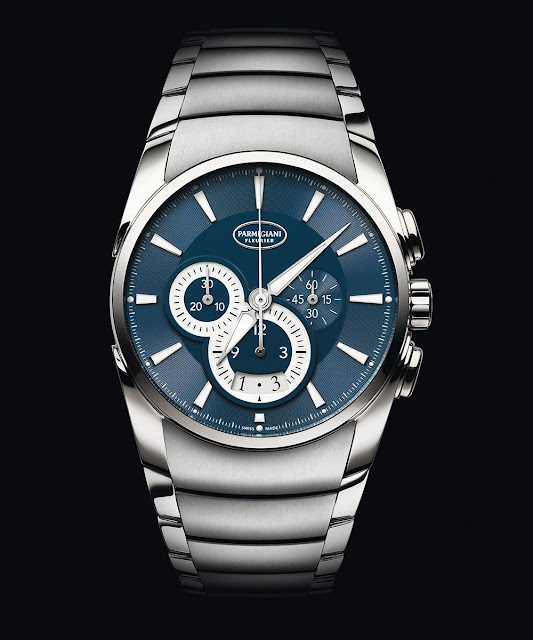 Parmigiani Fleurier Tonda Metrographe Abyss Blue. 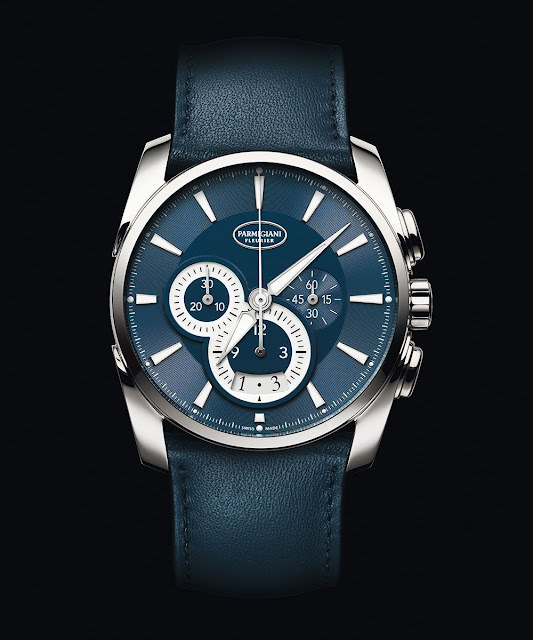 As a preview of the novelties prepared for the SIHH (Salon International de la Haute Horlogerie) 2016 that will take place in Geneva next January, Parmigiani Fleurier unveiled the Tonda Métrographe Abyss Blue, an elegant chronograph equipped with the automatic PF315 calibre.The price is Swiss Francs 11,900 with strap or Swiss Francs 12,500 with bracelet.